Baca has become a victim of his own ego & arrogance. Because he if legally "Hispanic", many politicians in LA County stand firmly behind him, and are quick to look the other way, when he's accused of corruption or abuse. His PR flack, Steve Whitmore, is a proven liar & apologist who is loyal to Baca & quick to condemn Baca's enemies, like the ACLU. A federal jury found Los Angeles County Sheriff Lee Baca personally liable for failing to stop inmate abuse in Men’s Central Jail. He must pay $100,000 in damages. The Los Angeles County Sheriff's Department (LASD), sometimes referred to as the Los Angeles County Sheriff's Office (LASO), is a local county law enforcement agency that serves Los Angeles County, California. It is the fourth largest local policing agency in the United States, with the New York City Police Department being the first, followed by Chicago Police Department and then the Los Angeles Police Department. The Los Angeles County Sheriff's Department is the largest sheriff's department in the world, and provides general-service law enforcement to unincorporated areas of Los Angeles County, serving as the equivalent of the county police for unincorporated areas of the county, as well as incorporated cities within the county who have contracted with the agency for law-enforcement services (known as "contract cities"). Forty-two of the county's 88 municipalities contract with the Sheriff’s Department to provide local police protection. These cities, range in population from 800 to 177,000, and in size from 1 to 100 square miles. The Sheriff's Department also holds primary jurisdiction over facilities operated by Los Angeles County, such as local parks, marinas and government buildings; provides bailiff service for the Superior Court of Los Angeles County; operates the county jail system; and provides services, such as crime laboratories, homicide investigations, and academy training, to smaller law enforcement agencies within the county. The Los Angeles County Sheriff's Department is also the second largest transit police force in the nation, aside from the NYPD, through policing contracts of the Metro trains and buses of the Los Angeles Metropolitan Transportation Authority and Metrolink. Furthermore, with policing contracts with nine campuses of the Los Angeles Community College and Lancaster Community College District, the LASD is the largest community policing agency in the United States. The department's headquarters are in Monterey Park. Baca is a very, very powerful administrator. See the primary link for much more information. Lee Baca, like all police administrators, is constantly besieged by lawsuits for whatever, whatever. The LA County Board of Supervisors haven't much to do with their time, don't get face time in the media, and are generally regarded as regulatory puffs. Political infighting is normal for LA, second only to fighting for tee times. Both species have their legal staffs that file and defend lawsuits, preferably before that three martini lunch, where both parties fight to cheap the tip. The Petroleum Club in downtown LA was once, perhaps still, the palace of swill where anyone who is anyone in LA politics gathered to jointly plan their next attacks on one another. "Keep the ball in the air" for the rubes while these politicos lift the wallets of the audience. Finally! Sheriff Baca resigns. 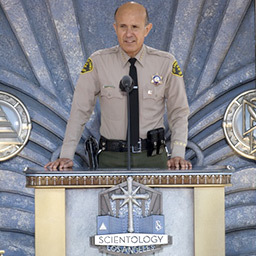 I bet the next Sheriff won't be in the disgraced Miscavige's pocket.